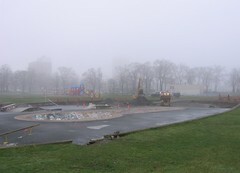 In the late months of 2004, the "Halifax Skatepark Coalition" started fundraising for a new, improved place for teens to hang out and do sketchy suspicious things. Don't get me wrong: I think having good recreational facilities is a good thing, but let's not get carried away thinking that an improved facility is going to improve the neighbourhood behaviour. Regardless. The website tells me that City Council finally approved the construction plans. Zowie! 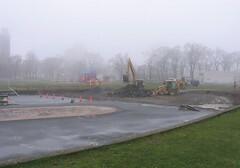 I was delighted this morning to see that work had commenced. 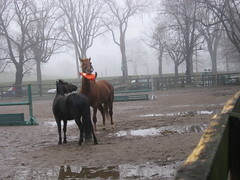 Also, here's a gratuitous shot of two horses fighting over a traffic cone. I ask you: Where else can you go to get all this? One last thing. This post, as you can see on the preceding line, was made with Qumana. I'm still searching for a good offline blogging program for macintosh. C'mon, you mac users. What are you using? Sooo...you can actually WALK to work? Jessica: Not for long :) After the house deal closes, I'll be a commuter again. Boo, hiss. But ohmygod do I love that house. Oh, and Hi Alex! (whoever you are) Nice to have you drop by. You certainly manage a lot of blogs. I'm challenged having only one.